So I was at the Association of Fundraising Professionals conference in Toronto. AND the city was hosting an amazing touring exhibit of everything Bowie – interviews, video, artwork, album notes, costumes and more. 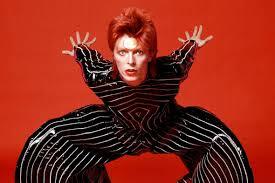 The takeaway: If you can’t find inspiration in Bowie, you’re in big trouble. So put on some lipstick and sparkly tights and let’s get started! 1. Be creative – find inspiration! Bowie doesn’t just sing. He paints, writes and designs crazy costumes. You know how to fundraise already, but how can you broaden your world of knowledge? Get out and volunteer for your organization on the front lines. Or read up on the latest research on your issue area. Or take an architecture course to decode the blueprints of your capital campaign. This will make you more engaging in your written and in-person communications. The best fundraisers are generalists who are engaging because they are passionate and always learning new things. Yes, just like you! 2. Don’t do what everyone else is doing! Bowie went with short, spiky hair in a time of rock and roll manly men with long manes! In fundraising, you plug along chasing that stretch goal like everyone else, but why not check out the private sector for something new? Explore sales teams of successful corporations – our sector is notorious for lagging behind current practice – and study new ideas around recruitment and retention. Need an example? Take Disney. The Big Mouse doesn’t want anyone to have a negative experience, to the point where they track the life-span of light bulbs in their hotels. They do this so they can go in and replace the bulbs just before they’re due to burn out! What can YOU do to ensure a seamless experience for your donors? Have a cocaine habit you can’t kick? Try moving to Berlin. Oh wait – that particular Bowie-ism really doesn’t translate well to fundraising. Instead, think about changing your point of view. When was the last time you interviewed one of your donors about why they give? How about the last time you got in touch with a colleague at a competing organization to share ideas and challenges? How about going on an information interview to explore what it is about your job that matters to you? Try one of these to kick-start your passion and change your perspective. This is brilliant! Put on your Union Jack coat and find inspiration! I enjoyed this blog. David Bowie’s eyes were different colors like mine and I love the idea of interviewing one of our donors about why they give. Since I started the BCIT Fundraising Certificate I have gotten in touch with colleagues from the industry, doing information interviews and learning a great deal about the charities in Vancouver. It is truly a must! Just today one of the person I had an info view with back in September emailed me wanting to know more about the BCIT courses and I offered to volunteer for her charity event. A Win – Win situation. Thank you.